Glastron has broadened the appeal of the GS 259 by adding an outboard option, but how does it perform? Once upon a time, it was clearly understood that a recreational cruiser was at its best when fitted with an inboard diesel engine. Given a steady supply of good fuel, clean air and regular services, such engines would reward you with endless reliability, cruising economy, lots of torque and optimised sea-keeping manners, courtesy of their natural position, deep beneath the cockpit sole. Now, however, in response to the buying choices being made by the vast markets of America, there has been a global shift toward outboard motors – and engine builders and boat manufacturers have been quick to collaborate with the trend. 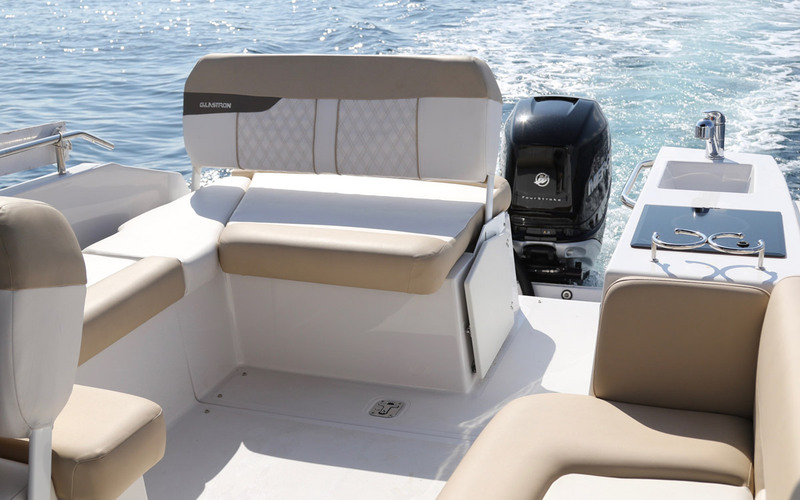 Outboard engines have increased greatly in output, with models from 300 to 400hp now readily accessible from the mainstream manufacturers; and the torque-optimised 425hp Yamaha XTO has brought an even more perfectly tailored cruising solution. 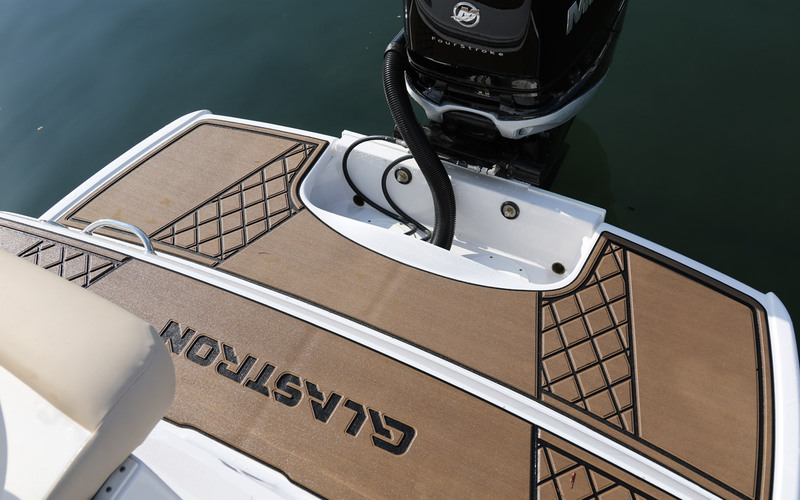 This has enabled the creation of outboard options for virtually every kind of sub 50-foot boat model, so it was only a matter of time before Glastron embarked on a similar campaign with its highly regarded GS 259. 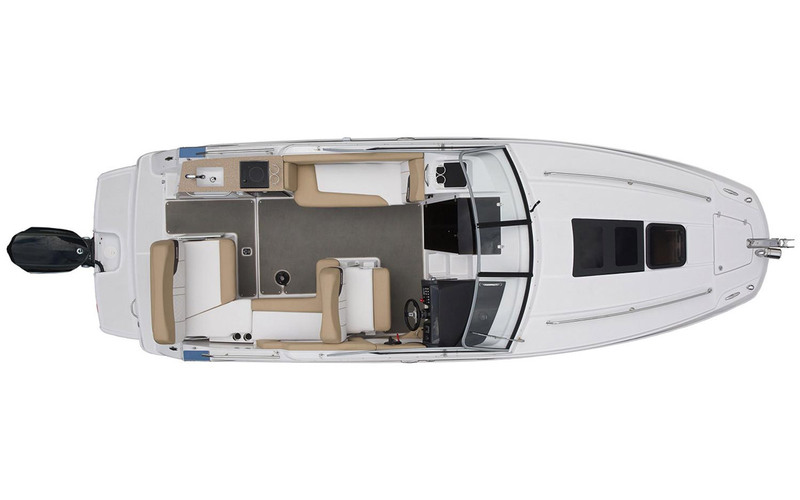 The Verado 300 is positioned a long way aft, at the trailing edge of the two-tier swim platform, and while that does little for the elegance of the GS 259, it does ensure that the back end of the cockpit remains largely unaltered. The two-man transom bench still has the capacity to face aft over the swim platforms; and the platforms themselves still afford you unencumbered freedom of movement from the water, from the pontoon and from the port side of the cockpit. Happily, the rest of the boat’s layout seems equally unaffected. 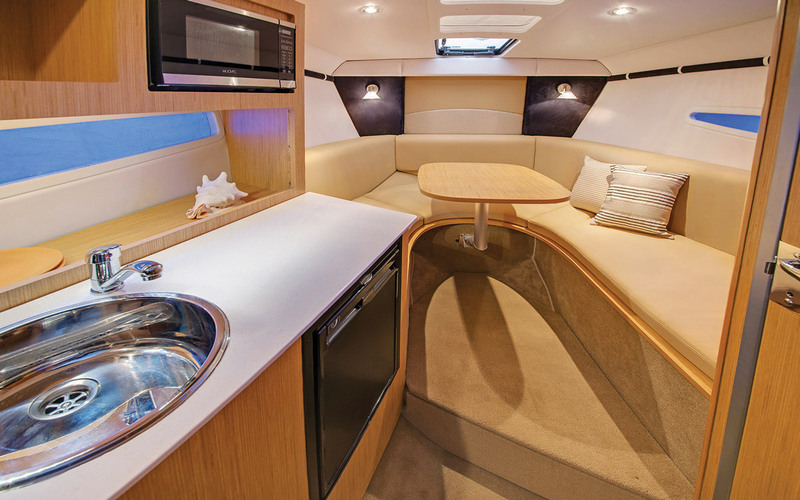 It still offers the four-berth accommodation, nine-man cockpit, separate heads compartment and full-height galley we’ve enjoyed before – but the absence of the inboard engine has enabled the GS 259’s lack of cockpit storage to be directly addressed. The vacated engine bay has been lined with vinyl panels on all sides, which means you can stow your bulky baggage in there without cluttering your cabins. True, it would have been good to see Glastron’s designers attempt something more ambitious with the space – perhaps even a camping berth for kids – but even in this most basic form, it’s still a major improvement to the boat’s cruising credentials. In principle, outboard propulsion has the potential to make Glastron’s excellent GS 259 even more attractive for boaters looking to make the transition from day boating to authentic cruising. But when you head out, it’s immediately evident that the impact here is both good and bad. On the one hand, there’s a pleasantly muted quality, both in terms of engine noise and vibration, that lends this boat a degree of refinement the original model can’t quite match. But while the established inboard GS 259 offers a composed performance in a lively sea state, the transition of so much weight up and aft has done the 259’s on-water performance few favours. While the top end of nearly 35 knots is similar, there’s a propensity to porpoise here, which takes a fair bit of work with wheel, throttle, leg angle and trim tabs to alleviate. It encourages you to plough the bow a bit more than you would naturally choose and that’s of no benefit to ride quality or cruising economy. In fact, with optimum fuel flow of between 2.6 and 3.0 litres per nautical mile and an unchanged 265-litre fuel tank, a range of around 80 nautical miles is down on the 250 and 300hp inboard models, both of which exceed 100nm. The pick-up is also less user-friendly. It spends the bulk of the lower rev band at displacement speeds, only settling onto the plane at around 4,600rpm. Its most frugal cruising speed is a rapid 30 knots with 5,500rpm on the clock. It feels fine at this speed and, with a 34.5-knot top end, outright pace is competitive, but compared to the inboard equivalent, this new outboard model feels a touch frenetic. The GS 259 OB differs from the original in precisely the ways you might expect. Its quiet ride and uprated storage capacity are counterbalanced by the fact that it is less frugal, less fun to drive and slightly incongruous to look at. 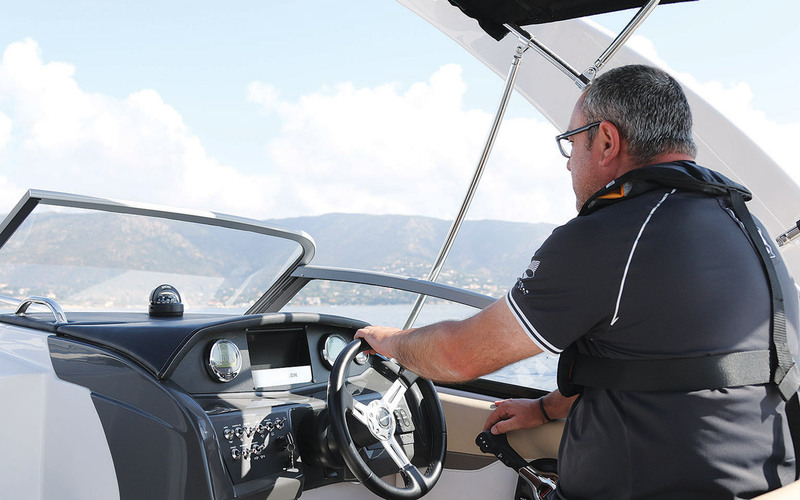 But that’s an issue of type as much as model – so while keen drivers and passionate purists will continue to scoff at the compromise in range, ride and seakeeping, the rest of the world’s boat buyers will simply rejoice that Glastron has embraced the zeitgeist and delivered the outstanding GS 259 in outboard form.